Washington (CNN) -- Washington Wizards point guard Gilbert Arenas admits he drew guns in the team locker room in a highly publicized December 21 incident, but says he was only kidding around. "I took the unloaded guns out in a misguided effort to play a joke on a teammate," Arenas said in a statement released Monday. "Contrary to some press accounts, I never threatened or assaulted anyone with the guns and never pointed them at anyone. Joke or not, I now recognize that what I did was a mistake and was wrong." Citing NBA sources last month, the New York Post reported that Arenas and Javaris Crittenton both brandished firearms in the team's locker room. Crittenton's agent, Mark Bartelstein, told CNN Monday that his client "hasn't done anything wrong. I'm extremely confident he'll be exonerated." Arenas, a three-time NBA All-Star, spent Monday afternoon in a voluntary meeting with federal prosecutors at the U.S. Attorney's Office in Washington and with D.C. metropolitan police about the incident, according to his attorney, Kenneth L. Wainstein. Video: Pro sport gun ban? "From the outset of this incident, Mr. Arenas has been fully cooperative with the investigation," Wainstein said in a statement, noting that Arenas relinquished the guns to Wizards security officers and met with authorities to "tell the full story." "Over the course of a two-hour interview this afternoon, Mr. Arenas answered every question asked of him," Wainstein said in Monday's statement. 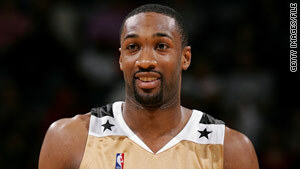 A spokesman for the U.S. attorney's office declined to comment on Arenas' statement, citing the ongoing investigation. Arenas said he told authorities that he stored four unloaded guns in his locker the Verizon Center to keep them away from his children. Arenas said he told authorities that he stored four unloaded guns in his locker the Verizon Center to keep them away from his children. "I brought them without any ammunition into the District of Columbia, mistakenly believing that the recent change in the DC gun laws allowed a person to store unloaded guns in the District," he said in the statement. He offered a public apology to the league, his teammates and his fans, saying, "I promise to do better in the future." NBA spokesman Tim Frank declined to comment on Arenas' comments, deferring to an earlier statement: "There is an active investigation by DC law enforcement authorities, which we are monitoring closely. We are not taking any independent action at this time."